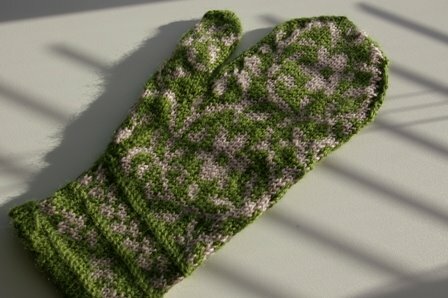 Although they aren’t finished yet, I thought I would show off the right-hand mitten while it’s drying. I have never done colour-work before so these were quite a challenge. I have tried to knit them before with Cascade but I found the yarn too bulky for a first-attempt project. At a LYS in January, I picked up some Mission Falls 136 Merino Superwash. It’s a DK weight yarn but I use that loosely because in my very humble opinion, I think it’s somewhere between DK and worsted. The colours I used were basil 532 & oyster 003. 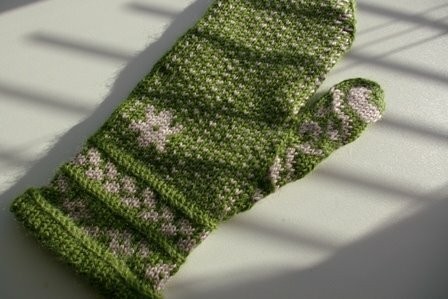 I used 2.25mm DPNs as my hands are only 7 1/2″ around and since the smallest size for this pattern is 8″, I thought the smaller needles would fix the problem & I was right. They are snug and perfect.